On March 24, 1963, His Excellency Bishop Alexander Carter of the Diocese of Sault Ste. Marie, dedicated the newly-completed Church of St. Andrew the Apostle, thus fulfilling another great achievement inaugurated to the glory of God by His Excellency, the late Bishop R.H Dignan and the late Monsignor J.C. Humphrey, V.G. who recognized the need for a church in the New Sudbury-Barrydowne area. Bishop Dignan officially founded St. Andrew the Apostle parish on September 15,1955 and appointed Father E.T. Kennedy parish priest of 275 families including two separate schools. 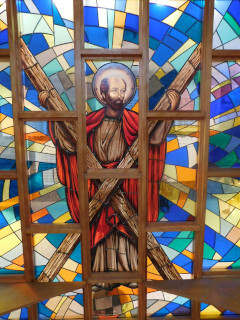 On March 19, 1956 His Excellency, the late Bishop Dignan, consecrated the church and since then, the grateful parishioners and its faithful pastors, have made St. Andrew the Apostle Parish one of the most active and progressive in Sudbury, ON. We welcome you to our community of faith! We would love to meet with you, to introduce you to a wide variety of opportunities to get involved, based on your skills, interests, and abilities, as well as to get to know your spiritual needs better. If you would like a “welcome appointment”, please call the parish office and speak with the pastor to set up a date and time. We look forward to hearing from you!